I had my son fill out a request sheet. Kinda like when you plan a baby shower, you ask the mom-to-be what their favorite color is, who they want to invite, their favorite foods, and so on. That way my son gave me a bunch of ideas as a starting point and he got to practice his writing skills over the summer. Bonus points! Extra hint: ask him to limit the number of guests because fewer kids means less mess and less stress. I definitely didn’t want to host it at our house and have to clean from top to bottom, plan out games and entertainment, and scrub red Kool-Aid off our carpet. But I didn’t have the money to bring everyone to the pool or some theme park. So I asked around my mom friends for brand new community parks that were free and not super crowded. 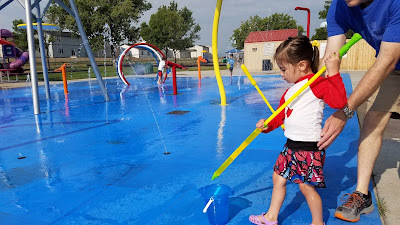 Found this awesome splash pad and playground area with picnic tables and large umbrellas. Score! Plus, since it’s outdoors, I don’t really have to decorate. As for time, I chose a Wednesday morning from 9-11 a.m. Yes, that meant only kids with stay-at-home parents could attend, but honestly, everyone’s so busy on the weekends, I knew it would be hard to reserve a Saturday. 9-11 a.m. was cool enough to hang out in the summer sun, and it was between breakfast and lunch, so I didn’t have to prepare a whole meal for 20 people. No more paper and envelop invites. Since we only invited four people, I just texted everyone individually, but you can also email them or set up a Facebook invite. I deliberately picked finger foods that didn’t need any cutting or utensils, as well as drinks like juice boxes and water bottles. That way I only had to bring paper plates and a roll of paper towels. For the cake, we just made cupcakes from a box, but you could easily pick up a cake from a grocery store or bakery to save time. Rather than send kids home with a bag of dollar store trinkets that will just get tossed in the trash by the end of the day, I went to the cheap toy section of Walmart and got $1 large plastic dinosaurs for the young kids and $2 generic-brand Nerf guns for the older kids. Staple a bag of candy and a thank you note to the top, and you’ve got a party favor. And there you have it! The kids loved the splash pad and playground, and the adults got to lounge around under the picnic umbrellas. 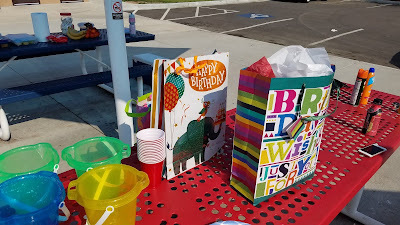 Around the 1-hour mark, we blew out candles, opened birthday presents, and handed out party favors, so that meant people were free to leave whenever they wanted. Couldn’t ask for an easier birthday party that my son absolutely loved! Any tips for planning an easy kids birthday party on a budget? Comment below to share your experiences because I'd love some ideas for next year! Hope you’re having fun with your kids, and I’ll see you next time!